To select the best plants or trees for your windbreak, consider the severity of the need as well as the space you have available and any ornamental qualities you prefer. This well help you determine which plants are most suitable for your property. Consider the conditions of your property and what you would like to accomplish. To screen a single level home from cold north winds you will not need a tall windbreak. To screen from strong winds in more open or rural areas you will need a dense windbreak. To screen a leisure area from summer winds you may only need a few ornamental trees under planted with attractive shrubs. The most important thing is to select plants that are hardy to your region, grows well in your soil type and that will withstand the windy condition. Your local University Extension Service may be able to give you good advice regarding plant selection for your region. You may also want to consider using a combination of plants that will not only look more natural but also allow you to include interesting or ornamental plants that work well with your landscape design. Evergreens are very commonly used for windbreaks. Dense conifers provide adequate windbreak in a single row. More open forms will provide 40% windbreak density and may need two rows or a mix of varieties in open prairie or rural areas. Spruce have dense foliage and grow relatively quickly. The foliage is typically dense right to ground level and do not experience much die back and needle drop on the lower branches. Black Hills Spruce Picea Densata and Colorado Blue Spruce Picea pungens both have very dense foliage and are slow growing at 6 to 12 inches per year. Large spreading roots and tough flexible wood makes them excellent standing up to high winds. They are very tolerant of road salt and are drought resistant but when planted closely in a windbreak it is important to give them adequate water. They will grow 50 to 100 feet tall, plant 16 to 20 feet apart. Disease problems can afflict the Colorado blue in Central and Eastern States. West of the Mississippi River they can live 80 or more years. White Spruce are very tolerant of strong winter winds with wide spreading roots and tough flexible limbs.. It can grow 2 feet a year and can live more than 80 years in a windbreak. it will grow 40 to 80 feet tall, plant 14 to 20 feet apart. Norway Spruce are fast growing at 2 to 3 feet per year and has tough flexible limbs. It is moderately tolerant of road salt. It does not like wet soil but is tolerant of just about any other soil condition. It will grow 50 to 100 feet tall, plant 16 to 18 feet apart. Cedar have dense foliage and grow relatively quickly. White Cedar will tolerate being planted quite close together. This allows you to create a dense but single row windbreak. They also shear well to create a nice hedge. White Cedar are quite sensitive to road salt. It will grow 30 to 60 feet tall, plant 5 to 10 feet apart. Eastern Red Cedar Juniperus virginiana will thrive in nearly any climate or soil. The dense foliage tolerates shearing to create a hedge or maintain size and is the best choice for a single row windbreak. Eastern Red Cedar has a moderate growth rate of 1 to 2 feet per year and is long lived. This is one of the best performing evergreens for a windbreak and will live well over a hundred years. Easter Red Cedar is somewhat tolerant of road salt. This medium evergreen tree will be up to 30 feet tall or more, plant 12 to 20 feet apart. Rocky Mountain Juniper Juniperus scopulorum is a slow growing evergreen of medium size. It will be up to 20 feet tall, plant 10 to 20 feet apart. Fir have dense foliage and grow relatively quickly. Douglas Fir are relatively fast growing at one to two feet per year and will reach 80 feet tall and 20 feet wide. The limbs are strong with a form that sheds ice and snow. Well drained soil is required, or plant on a slope. Douglas Fir are somewhat tolerant of road salt. Plant 14 to 20 feet apart. Concolor Fir Abies concolor grows at a medium rate of 12 inches per year with a nice compact pyramid form. The roots are shallow and spreading with branches not quite as strong as spruce but typically do not sustain ice and snow damage. But this fir needs well drained soil and performs best as a windbreak tree in the high plains states where it can grow from 30 to 100 feet tall and 15 to 25 feet wide and live more than 40 years. Plant 14 to 20 feet apart. Canaan Fir Abies balsamea phanerolepies grows one to two feet per year and will reach 50 feet tall and 15 feet wide. This fir adapts to more growing conditions than the Balsam or Fraser fir, performing very well in windbreaks all across the central plains and Midwest as well as the east coast. Plant 14 to 20 feet apart. Balsam Fir is nearly indistinguishable from the Canaan Fir. With superior performance the Canaan Fir is suggested as a better choice for a windbreak. Pine have moderately dense foliage. Lower branches in particular may experience die back and heavy needle drop. Austrian and Scotch Pines are somewhat prone to insect and disease problems as they mature and in general may decline in health after 20 to 25 years. Austrian Pine Pinus nigra Austrian Pine provides a medium density. This is one of the best performing evergreens for a windbreak. This medium sized evergreen will be up to 35 feet tall, plant 15 to 25 feet apart. White Pine grows well in sandy soil and is drought tolerant. It is fast growing, 2 or 3 feet per year. A good root systems holds up to wind, but the slightly brittle limbs can break from snow, ice and heavy wind. White Pine are very sensitive to road salt, which can easily be thrown 60 or more feet by a snow plow. It will grow to 50 to 100 feet tall, plant 16 to 18 feet apart. Ponderosa Pine Pinus ponderosa are a medium sized evergreen with medium density. This is one of the best performing evergreens for a windbreak. It will be up to 35 feet tall, plant 15 to 25 feet apart. Afghanistan Pine Pinus elderica is a very tall evergreen with a narrow form that grows fairly quickly. This is one of the best performing evergreens for a windbreak. It will be 50 or more feet tall, plant 10 to 20 feet apart. European Larch Larix decidua is not commonly planted because it looses its needles in winter. However it still performs amazingly well as a windbreak because of its dense thicket of branches. It grows very quickly and can reach 12 feet in 5 years, much faster than any conifer and will reach 100 feet tall. For a fast start to your windbreak, combine this Larch with other slower growing evergreens. Plant 16 to 20 feet apart. Bald Cypress is a small evergreen reaching only 15 to 25 feet in 20 years. It grows well in clay soil and will tolerate poorly drained soil. Arizona Cypress Cupressus arizonica This is one of the best performing evergreens for a windbreak, but the trees can become brittle with age. This medium evergreen will be up to 30 feet tall, plant 15 to 25 feet apart. Arborvitae are a good selection for a smaller windbreak since they grow in a somewhat columnar form. The foliage is dense so you can plant a single row windbreak. And it takes to shearing well to maintain size or form a hedge. They are strong and slow growing with varieties up to 20 feet tall. Techny Arborvitae is the best Arborvitae for a wind exposed site as it is very wind and cold resistant. It is well rooted, but the limbs can be susceptible to breaking under the weight of heavy snow and ice. Arborvitae can recover well from a limb or leader lost. Grows to 30 or more feet tall, plant 12 feet apart. Green Giant Arborvitae Thuja green giant is commonly planted for windbreaks, but is a very poor choice. It is not particularly hardy and is very susceptible to winter burn. They also do not grow nearly as quickly as advertised. Green Giant will do well in warmer regions of zone 6. Pyramid Arborvitae thuja occidentalis pyramidlis will grow 1 to 2 feet per year and will live 70 years or more. Regular moisture is very important, especially when closely planted for a windbreak. The shallow roots will not hold well in sand in rural areas but a very good choice for suburban property windbreaks. Will reach 30 or more feet tall, plant 5 feet apart for a single row, 6 to 10 feet apart for double rows. 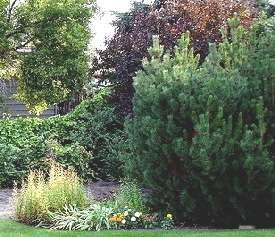 For a windbreak to screen summer winds, use a combination of trees and shrubs. Hackberry Celtis occidentalis is a slow growing deciduous tree with medium foliage density. It is a tough street tree with excellent drought resistance. Will be 20 to 30 feet tall, plant 10 to 20 feet apart. Bur Oak Quercus macrocarpa is a tall deciduous tree with moderate growth rate and dense foliage. it is quite tolerant of just about any conditions. It will be 15 to 25 feet in 20 years, up to 40 feet tall, plant 15 to 25 feet apart. Redbud Cercis canadensis is a small multi trunk tree or large shrub with good ornamental qualities. It has a showy spring flower display before the leave unfurl. It will be up to 15 feet tall, plant 10 to 15 feet apart. Amur Maple is a large shrub that will be 16 feet or less in 20 years. It is tolerant of shallow and dry soil. American Highbush Cranberry Viburnum trilobum grows at a medium rate and will reach 12 feet tall or more. It will live a long time looking fresh still at 25 years old and does not sucker. Spring flowers and late summer berries are both very attractive. Plant 8 to 16 feet apart. Cutleaf Staghorn Sumac is a large shrub or small multi stemmed tree that will be about 8 feet in 20 years. It is very tolerant of just about any site conditions and is very tolerant of shallow dry soil. Dogwood especially Silky Dogwood, Red-osier Dogwood and Gray Dogwood, are native to the North Central Region and are extremely winter hardy. After 10 to 15 years it will need some rejuvenating pruning or hard prune just above ground level to completely refresh the plant. Flowers are produced in Spring and blue fruits in late summer. 5 to 10 feet high, plant 8 or more feet apart. Lilac Syringa vulgaris - Villosa Lilac Syringa villosa is a hardy flowering shrub from China that is a bit smaller than the native lilacs and will not sucker. Grows to 8 feet, plant 6 to 8 feet apart. Ninebark is drought tolerant and grows quickly, producing small flowers in spring. It will reach more than 10 feet tall, plant 6 to 8 feet apart. Cotoneaster Cotoneaster acutifolia has a moderate growth rate and is very tolerant of poor conditions. It will reach at least 5 feet and live for 20 years or more. White Honeysuckle is a very dense shrub that grows to more than 8 feet and will live for 20 years or more. Spring flowers and late season fruit is very attractive. Jack Pine Pinus Banksiana is not suggested for windbreaks. The roots will not hold up to strong winds and the wood is weak. Scotch Pine Pinus sylvestris is not suggested for windbreaks. They are susceptible to Pine Wilt disease throughout the Midwest. Root systems are inferior and the wood is weak. Green Ash Fraxinus pennsylvanica is a medium deciduous tree with medium foliage density than has been planted extensively throughout the Midwest. But is it highly susceptible to the Emerald Ash borer and should no longer be planted. It grows at a moderate rate. It will be up to 30 feet tall, plant 10 to 20 feet apart. Hybrid and Lombardy Poplar Populus nigra are suitable only for a temporary windbreak while your permanent trees grow. It grows very rapidly, is susceptible to borers and produces suckers. Aspen are very susceptible to limb loss. Siberian Elm is very fast growing and very susceptible to limb loss. Also produces messy, nuisance seeds. Russian Olive Elaeagnus angustifolia is actually and excellent windbreak tree but does have problems. Sharp spines are produced on the branches and it spreads seeds. In some regions it is considered invasive. Black Locust Robinia pseudoacacia fast growing with weak limbs and short life. Susceptible to the locust borer. When creating a windbreak in suburban areas where winds are not as ferocious as rural areas, you will be able to select a pleasing combination of evergreens, deciduous trees and shrubs. It is still important that they be hardy and strong and not susceptible to drying winds, but not essential that you stick to a list of plants that are highly suitable for windbreaks.